The global retail supply chains have been presented with a wide range of challenges over the past year. In addition to having to restructure systems to support the rise of e-commerce and omnichannel purchasing, there have also been a number of economy shifts and fluctuations in oil prices that have stagnated shipping operations. This week, the National Retail Federation announced its monthly Global Port Tracker report, performed in collaboration with Hackett Associates, which revealed that "[i]mport cargo volume at the nation's major retail container ports is expected to decline year-over-year for the next few months but the first half of the year should still amount to a 4.5 percent increase compared with the same period last year." In the statement, NRF Vice President for Supply Chain and Customs Policy Jonathan Gold explained that merchants are focusing on inventory management and making sure they are prepared for upcoming seasonal sales. He added that it is difficult to predict this year's industry activity based on the previous year because of the recent issues faced at port terminals on the West Coast. Ben Hackett, founder of Hackett Associates, explained that the government will play a crucial role in how sales pan out in 2016. "Governments around the globe need to support economic policy that is pro-growth and avoid actions that get in the way of the business community," Hackett stated. "This is not the time, for example, for the U.S. Federal Reserve or other central banks to increase interest rates." This week, the NRF also released its 2016 economic forecast report, which revealed that retail sales are expected to see a 3.1 percent increase throughout the year. Although this growth is higher than the 2.7 percent 10-year average, it is lower than what the NRF's original 2015 forecast. In addition, the organization also said non-store sales are expected to rise by somewhere between 6 and 9 percent. Furthermore, the economy is getting stronger and unemployment rates are remaining relatively low. "Wage stagnation is easing, jobs are being created and consumer confidence remains steady, so despite the headwinds our economy faces from international developments - particularly in China - we think 2016 will be favorable for growth in the retail industry," NRF President and CEO Matthew Shay said. "All of the experts agree that the consumer is in the driver's seat and steering our economic recovery." Shay also agreed with Hackett's statement pertaining to the crucial role of government agencies, indicating that they need to avoid enforcing regulations that "create hurdles toward greater capital investment." Instead, Shay proposed that the priority should be on developing policies that enable merchants to better compensate employees. In the statement, NRF Chief Economist Jack Kleinhenz noted that as unemployment rates decrease and consumers have more discretionary income, the retail industry will continue to grow and benefit. 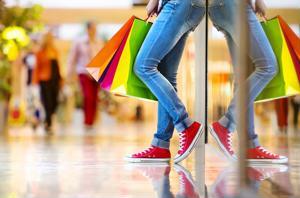 The NRF tracker report does not include automotive, gas or restaurant purchases. However, fuel prices may be a major contributing factor in consumer spending. According to the Associated Press, this NRF retail sales report is indicative of consumer spending, "which drives 70 percent of the economy. Yet retail sales account for only about one-third of all spending, with services such as haircuts and Internet access making up the other two-thirds." The AP revealed that AAA found the recent national average of gas prices was $1.70 a gallon, a 27-cent drop from January. This decrease in gas costs, the source argued, is "dragging down the overall retail sales figures, which include gas but don't account for price changes." In 2015, Americans put more money away in savings than economists assumed they would, the AP revealed. Therefore, consumer spending and the 2016 economy will be largely influenced by two factors: How much people decide to put in savings and what they do with extra money that results from higher income and lower fuel costs. Last month, consumers increased spending on vehicles, groceries and e-commerce products. And while they didn't seem to spend much on going out for dinner or drinks, the source indicated this could be attributed to the harsh weather conditions that hit the East Coast.